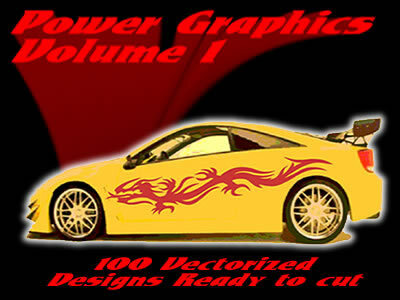 Power Grafx by Full Intensity Grafx. There are 100 plotter ready designs that come in 3 formats including ai.,eps. and .cmx. A full color book and cd comes with purchase. With a wide variety of designs such as flames, robots, dragon, tribal flames and designs, you can't go wrong. Each design is ready to cut with no intersecting paths and clean lines.